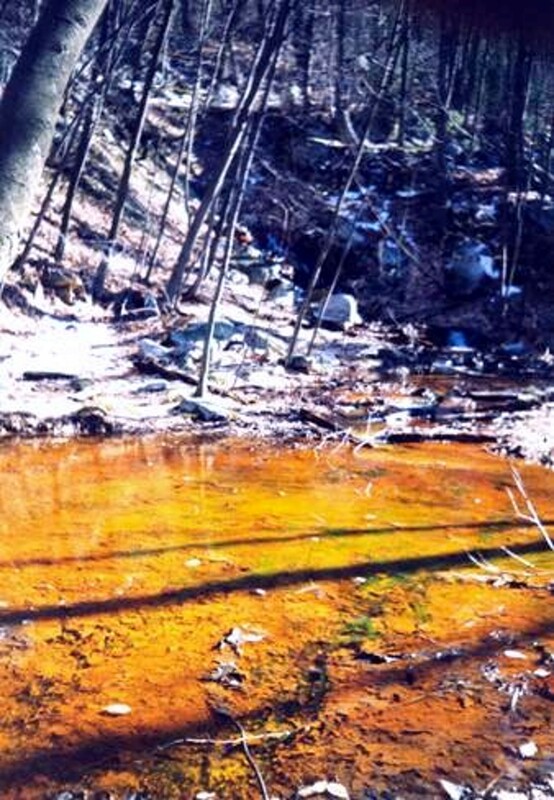 Nicknamed "Yellow Boy," acid mine drainage is common throughout Stony Valley and surrounds. The years of deep coal mining had fractured the naturally existing rock layers and left the water emerging from the mines yellow-orange in color with a noticable sulpher smell. It might make a great contrasting picture (as it did at the old coal mining town of Kalmia, just north of Stony Valley), but it's horrible on the environment. Acid mine drainage occurs, primarily, with deep coal mining that occurs below the water table. In places like Rausch Gap where pumps were employed to keep the water out of the mines, the problem starts when the pumps are shut off. Around this time water starts to flood the mine, as it likely did in Rausch Gap and definitely did in Kalmia. With rocks in the mine that carry "metals" now being exposed to both air and water, the produce a chemical reaction and let loose their acidity on the surrounding watershed. Simply, acid mine drainage decreases pH levels in the water. An independent study showed that acid mine drainage in Stony Valley presents a pH of 3 to 4, whereas the "healthy waters" we need for aquatic life generally fall in the 6 to 8 zone. To remedy this, individuals such as the volunteers at Trout Unlimited, dump limestone (which is a high pH) into the water to counter the acid mine drainage (which is a low pH). These neutralization systems, which in this case are in the form of a diversion well, slowly release the limestone into the rushing waters of Rausch Creek through use of a diversion well, which redirects some of the creek's water through pipes guiding water into the limestone hoppers. The released water then mixes with the main stream of Rausch Creek once again and insures that aquatic life can exist after years of mining in the region. (Left) Rausch Creek wells installed in 1987 and 2000. 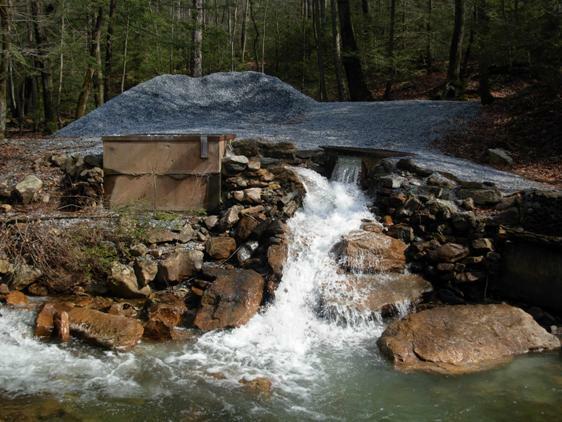 Diversion Well project in 2006 to learn how the "Diversion Well Gang,"
the acidic waters of Rausch Creek. For more information about the Rausch Creek Diversion Wells, please visit the Doc Fritchey Chapter of Trout Unlimited's website.